Turnstyle Designs have been creating door hardware for just over twenty years. The range started with five hand cast composite door knobs and has since grown into what you see here, with over 100 different designs, 30 different product types and over 30 different materials and finishes, giving a combined choice of over 2000 design and finish options. Turnstyle Designs offers a variety of Amalfine, leather and brass high quality design products. "Carlisle Brass has been designing and manufacturing architectural quality ironmongery for over 28 years. Our branded products are the preferred choice of architects, specifiers and professional installers as our comprehensive ranges provide the complete ironmongery solution." "Expertly hand-crafted in France from the finest natural materials, each item is unique. And as we design all our own models, they can truly be called "Bouvet originals". 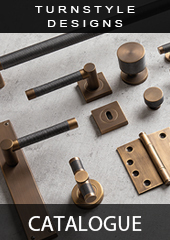 Bouvet offers steel and brass ironmongery with Pewter, Black, Rust Effect, Polished Brass, Satin Brass and Antique Brass finishes. J. Bros has built its fame upon 40 years of experience in quality and innovation. J. Bros specialises in French finialled hinges, espagnolettes for shutters or windows and cremone bolts for doors or windows. They offer a variety of finishes to compliment your home which can compliment the Bouvet range of fittings. Finesse Design offers you award winning and brilliantly original designs in pewter. These products will grace the home of anyone with an eye for inspirational design. With over 30 years manufacturing experience and combine modern production techniques with a handcrafted finish that highlights the natural beauty of pewter. For hundreds of years, steel has been renowned in this part of England, from Sword makers to Ship builders, it has simply shaped generations. Our company is situated on the very spot where in Consett Co.Durham the old steel works used to stand at one time being one of the most prominent steel making towns in the world. It seems quite fitting that the Stonebridge Collection is now available from here. One thing that hasn’t changed is the natural beauty surrounding us, the North East being one of the most untouched corners of the British Isles. Probably one of the most iconic landmarks in the country today stands proud on the outskirts of the City of Newcastle, reminding us that skilled Steel workers are alive and well. "Frank Allart and Company Limited was founded in 1914 by George Allart and originally named after him. In 1945 the company changed to Frank Allart, named after his son. The company started as patternmakers, but soon built up a reputation for high-class brassware for the architectural, marine and railway trades. We have a thriving design department, which blends the use of sophisticated computer-aided design equipment with more traditional arts such as model making." Frank Allart offers a variety of beautiful fittings and finishes to compliment your home decor. The catalogues are split into different sections. They start with door fittings which range from traditional to contemporary styles, then to a Allart Select custom range where you can mix and match your door lever or door knob of choice onto your preferred backplate or rose. There is a huge selection to choose from! From there your choice of door bolts, cremone units, door stops, door holders, cabin hooks, coat hooks and then onto the window fittings collections. SIMONSWERK aim for perfection in all areas right from the outset. Quality requirements begin with the selection of high-quality raw materials allowing the largest possible freedom of design, providing diverse options for surface refinement and protection against corrosion. In house departments develop tools which guarantee top precision in manufacturing. Quality assurance means more than control, it entails continuous improvement and development. Material and quality checks are carried out in close cooperation with testing institutes. These include fire prevention and protection, break-in protection and sound insulation tests as well as constant load tests according to CE guidelines. Simonswerk offers their high quality brass hinges in a variety of finishes and designs. Guardian Lock & Engineering Co. Ltd. was founded in 1982 in Willenhall, West Midlands, which has been the centre of the lock making industry in the U.K. for some 500 years. The current premises which were purpose built for a lock manufacturer in the early part of the twentieth century have been extended and modernised. Today the company operates from this well equipped facility continuing a tradition of excellence in the manufacture of mortice locks, latches and complementary products marked under their well know trade name IMPERIAL. Unlike many lock manufactures, we do not source products from low cost economies believing as we do, in the manufacturing skills and quality which are the hallmarks of British industry. "Established in 1971, The Quality Lock Company, like much of the Willenhall lock trade, began as a small shed business. Selecting the finest regional craftsmen, the business grew by word of mouth recommendations. Our locks are hand measured, hand filed and individually inspected, with each component separately hand-crafted from brass. Exceptional in appearance, unrivalled in durability and premium in quality, our rim locks are used in some of the UK’s finest establishments."